Victoria was hit by what the Bureau of Meteorology called a “weather bomb” on June 24, 2014, including destructive winds, high tides, heavy rain and blizzard conditions in the alpine region. with their continued vicious attacks on the most vulnerable people in Australia – and elsewhere – we must not forget asylum seekers, and the outrageous revision of foreign aid. Is it “just” entitlement on their part, the “born to rule” mentality writ large? Or is it something more? Is it possible that behind their uncaring disdain lurks fear? Are they so terrified of us that they’ll do … almost … anything to destroy us? and six months into what will be a long winter of discontent (geez, where’s Richard III when you want him?) we must remain strong in our friendship. There is such a thing as community – and the community of The Pub is part of our individual strength. So let’s spend this Friday evening together, enjoying the music, the raffle, the drinks, the food – AND the friendship. 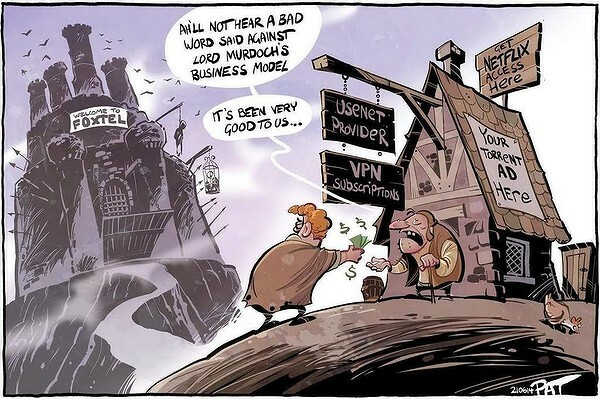 The cartoon above reminds us not to forget the nobbling of the NBN to benefit Foxtel, and then nobbling downloaders to benefit Foxtel’s programming investments. Foxtel is the main source of profit for Murdoch’s Australian operation. If it folds, then the Old Man will be humiliated in front of the Gnomes of New York who refused to back his own business model for News Corp. They want to make some money, not indulge Rupert’s dynasty fantasy. The Gnomes hived off the newspapers around the world, and kept the profitable parts – mostly movies and entertainment – separate… everywhere except in Australia, where pay TV was bundled in with the newspapers to prop them up. Australia is special for Murdoch. It’s his “home ground”, where he was spawned. He still thinks he can keep control of it and use it as a redoubt to marshall his forces under a friendly government, once again to strike out at the world and take it by storm. I’ve always thought Foxtel was the key business for Murdoch. So much damage has been wrought on our local polity, our governance, our technological infrastructure, our wallets and our freedoms to prop it up. Even the ABC has been nobbled: they lost Australia TV, and lost access to the BBC when Murdoch gazumped them with big money. But still Foxtel stubbornly refuses to grow. Increases in sales are desultory. The business model of giving sham value – hundreds of channels full of rubbish – is failing. Packages abound. If you have Foxtel and want to quit, you get badgered by them with better and more generous deals offered (my own personal experience). You have to be determined to resist. The Foxtel technology is antiquated: a proprietary physical cable, a set-top box, a smart card. It’s too hardware-based. These limitations mean that if a new customer wants a Foxtel connection a gang of workers has to come out to your property with back hoes and shovels to dig a trench. Someone has to pay for that. Soon it will be us. Why us? Because Murdoch’s Foxtel HFC cable is due to become part of Turnbull’s “NBN”. When a new HFC cable is installed, we – the taxpayers – will pay part or all of the cost, relieving Murdoch of one of the greatest cash drains in his operation. We are being stitched up. The ABC will be emasculated, punters will pay more for services they don’t want. All so the Old Man can thumb his nose at New York, who said he’d never make the Australian territory pay. They didn’t reckon on his determination to buy a country and its government. Unfortunately for Murdoch, he is old. And his kids, the ones he’s anointed to run his businesses are dopey. The only one he hasn’t given the nod to, Elisabeth, the smart one, has been side-lined. There is hope. The government he has entrusted to shore up his local empire is dopey as well, and hated. They’ve turned on everyone who voted for them – pensioners, disabled, foolish educators who believed that “Unity Ticket” crap, even more idiotic technocrats who didn’t believe Turnbull would actually “destroy the NBN”. But not all supporters are voters, or more accurately have large numbers of votes at their disposal. They have money instead. Big Business, short on votes, but long on money and ability to donate, thought Murdoch’s Australia would be a land of milk and honey. It was expected that confidence and prosperity would return, literally overnight after the election. I can still remember Ray Hadley confidently predicting that the shops would “be full tomorrow”, the day after the Liberals wiped out Labor in Western Sydney. Reality has superseded that expectation (and Labor didn’t get wiped out). There now seems to be a definite chance that it’s going to turn into a train wreck, as the train of spin meets the brick wall of reality. Things aren’t going too well. Eventually the public will have to choose between the naive, “Bread and circuses” Reality TV show that’s been provided for their tittilation – Gillard scandals, Rudd Restorations, rats whiskers on the Speaker, hookers, 20 year old “scandals”, “Budget Emergencies” and the like – and the brutal facts of the Budget that takes away their entitlements (yes… entitlements) and replaces them with the Law Of The Jungle, Abbott and Murdoch’s jungle. The “Budget Emergency” will have to be discarded in the minds of the punters, if for nothing else, then just for self-preservation. Without a “Budget Emergency” it becomes permissible to to start whingeing about your lot in life without that nagging guilt of going against the national interest. It’ll go, and along with it, the whole basis of the Budget and the government’s pitch for legitimacy. Now, not so much. It’s starting in the warehouses, and moving up into the sales offices. People are openly berating the government, looking for fault. You can’t find a lot of punters who admit they voted for Abbott’s mob. Many of these did, of course, and may vote for him again, but right now they’re going with the mob in condemning him. It’s the fashionable thing. After “fashion” comes “mindset”. Then comes “common wisdom”. People are sick of eternal struggle. They’re sick of politics and stress. They want to relax and enjoy the benefits of this great country they live in, without being hectored, divided into factions and demographics, and then encouraged to disparage, heckle or pick on each other. 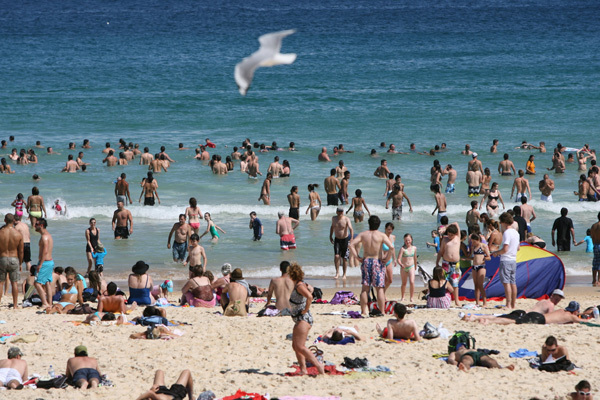 Australia is not a hot-headed country. We’re more laid back about our politics. We like to be “relaxed and comfortable”. Culture wars, seething anger, envy, polemics, lies, spin, scandals and the rest are fun while they last, but we’re tired now. We want our government to deliver, but in many cases the promises have been broken, and in others the “hundreds of policies” that we were promised were “costed and ready” haven’t got past the back-of-the-envelope stage, pending a thorough vetting by the warriors of the right, for ideological purity. Australia is small enough for a few players to control. Media moguls, miners, a few banks and two supermarket chains take up far too much of our time and soak up far too much of our disposable income. Our exports are few. We are the world’s consumers. The few who are not involved in this handful of enterprises sell each other real estate and do each others laundry. Scientific research is becoming a secondary, marginal occupation. The physical reality of Climate Change is denied and ridiculed. It is still a “Debate” here, as it is almost nowhere else in the world. Our IT infrastructure is third rate, soon to become fourth or fifth rate, the better to keep antiquated delivery systems artificially current. We are controlled by a cabal of niche business operators who think they pays us too much for too little work, and who can still buy whole governments to do their bidding… changing laws to benefit them, crushing those who oppose them, suing, arresting and trying – or investigating via Royal Commissions – those who are in their way. If one of our main exports was bananas it would be perfect. But bananas – and most of our other agricultural produce – were dealt out of the last two “Free” trade agreements we have entered into. Banana republic is a political science term for a politically unstable country, whose economy is largely dependent on exporting a limited-resource product, e.g. bananas. It typically has stratified social classes, including a large, impoverished working class and a ruling plutocracy of business, political, and military elites. This politico-economic oligarchy controls the primary-sector productions to exploit the country’s economy. Yes, even “political instability” applies, unless you want to argue that the last election, and the media-legal trail of destruction leading up to it, wasn’t a stitched-up farce. Yep, “banana republic” does it for me. But what are we going to DO about it?